The legume section in my pantry is overflowing, it’s time to empty some lentil boxes! 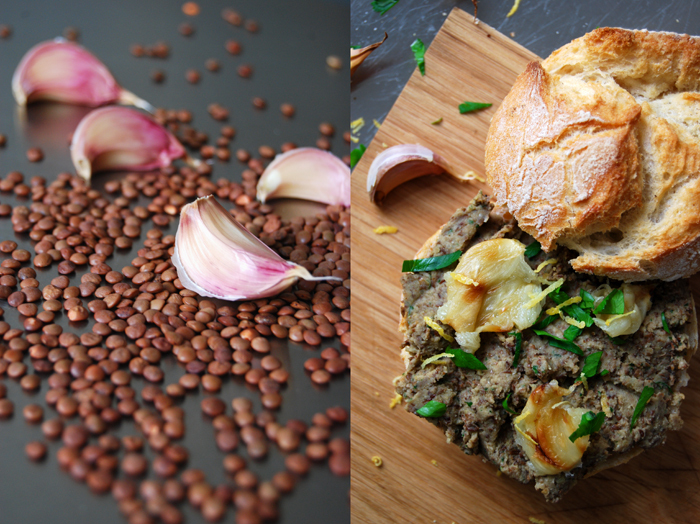 My plan is to make a smooth lentil mousse enhanced with parsley, lemon and garlic, to spread on sandwiches and to eat together with raw vegetable sticks. I prepare a big bowl as we’ll have my brother in law over for the next couple of days. When guests stay with us, I like to have some food ready in the fridge, easy nibbles and snacks that everyone can enjoy whenever they feel like, but first I’ll need the mousse for my Sandwich Wednesday. 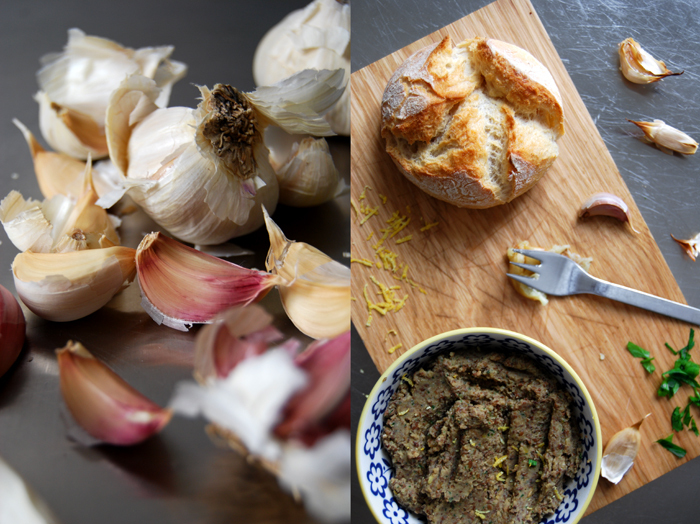 Besides the lemon and parsley aromas, the garlic plays an important role. I don’t leave it plain and raw, I roast it, golden and sticky, almost sweet. I bake big, fleshy cloves in their skin and after 10 minutes in the oven they turn into a delicious paste. They taste so good that I throw a couple more into the oven, as an extra topping. 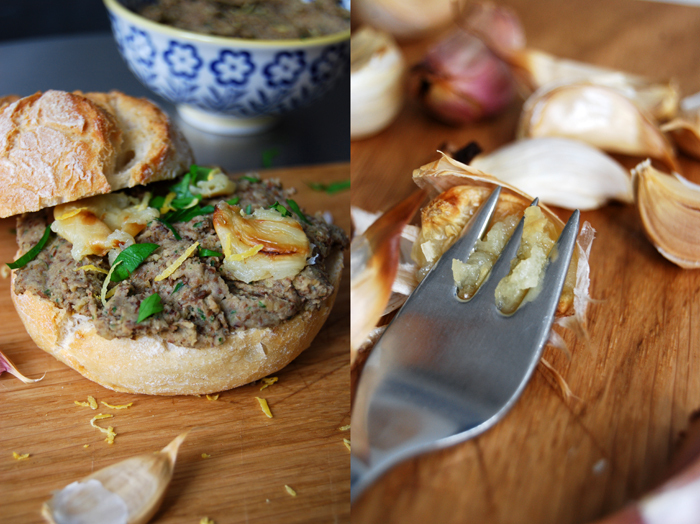 Squeezed with a fork I lay the warm and juicy garlic on top of the lentil spread. This is such a great combination, the nuttiness of legumes together with the sourness of the lemon juice and zest, the aromatic parsley and the sweet and spicy garlic. I’ve made a few variations on this lentil mousse already, but this one is the freshest! For the sandwiches you need white buns with a nice crust, crisp and crunchy. I made lots of mousse, it stays fresh for a few days. It’s also great as finger food for parties, on slices of bread or served together with vegetable sticks! Cook the lentils in 1 liter of water together with the bay leaf for 20 minutes or until they are done. Don’t season with salt yet or the lentils will stay hard. Take out the bay leaf and drain the lentils. Set the oven to 220°C / 430°F (I used the Rotitherm roasting setting) and roast the cloves of garlic in their skin for 12 minutes or until they are soft. 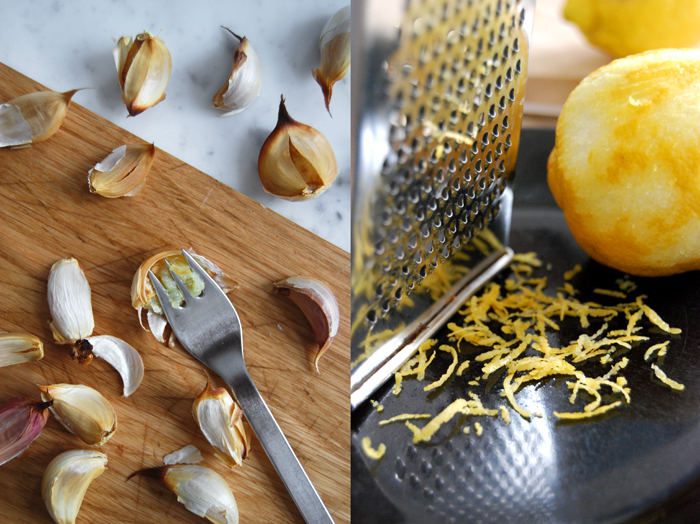 Peel the garlic and squeeze with a fork. Mix the lentils in a blender to a smooth paste together with the parsley, lemon juice and zest, olive oil and half of the garlic. Season with salt and pepper to taste. 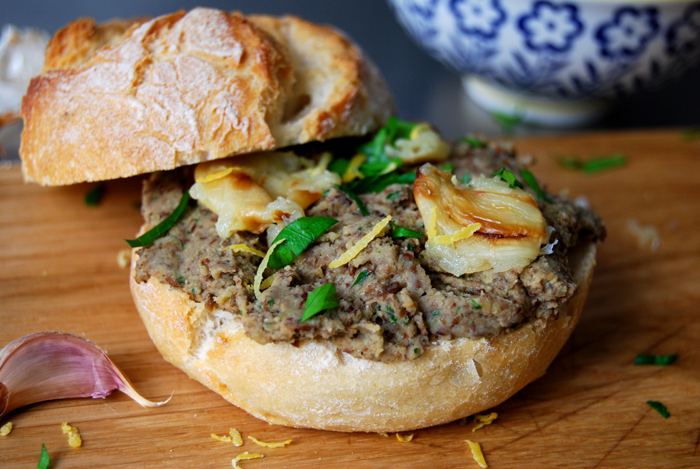 For the sandwiches, cut the buns in half, spread the lentil mousse on one side and lay 1 or 2 squeezed, roast garlic on top. Sprinkle with some parsley and lemon zest and close the bun. What an interesting idea! The flavours in this sound wonderful and it sounds like such a useful thing to have in the fridge – ready to dip or spread or eat with a spoon! We opened a package of Maltese water crackers last night, dipped into the mousse it was a delicious snack! You can really play around with the recipe, sometimes I add sun-dried tomatoes, spices or different herbs.